As most liturgy geeks know by now, after Vatican II, all of the liturgical rites of the Church were speedily revised, and most of that was done decently enough. As the world’s bishops embraced the vernacular in the years after the council, translations were rushed into place. These are acknowledged by all as less successful from an artistic or “faithfulness” view. But they were all seen as a temporary measure–a decade or two at the most–until serious revisions could be completed, and a period of experimentation and evaluation had progressed. As a first result of this time of assessment, the pastoral care rites were promulgated in 1982, and Roman Catholics were given until the first of January 1984 to implement fully. There’s a good bit in the document, as we’ll see. Naturally, there is a general introduction of 41 sections. This section is to the rites of anointing and viaticum as the GIRM is to the celebration of Mass. It tells the clergy and people how to celebrate these rituals and gives a good dose of liturgical law as it applies to these rites. Then we have Part I, Pastoral Care of the Sick, covering, in turn, an introduction (42-53), visits to the sick (54-61), visits to a sick child (62-70), and Communion of the sick in both long form and short form (71-96). You may remember we touched upon Communion to the sick here at Catholic Sensibility earlier this year as part of the series on Holy Communion and the Worship of the Eucharist outside of Mass. We’ll look at it in a bit more detail when we hit sections 71-96 later this Fall. 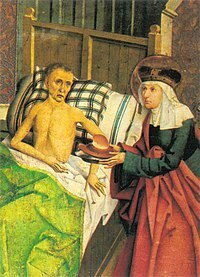 Anointing of the Sick, within Mass and otherwise is covered in sections 97-160. Part II treats Pastoral Care of the Dying and includes an introduction (161-174), the celebration of Viaticum (175-211) within Mass and otherwise, the Commendation of the Dying (212-222), Prayers for the Dead (223-231), and Rites for Exceptional Circumstances (232-296). That’s the outline for what we’ll cover. Hang in there with us; these are important rites a priest uses weekly and hospital chaplains sometimes daily. Lay people participate in these as sacramental recipients and sometimes as leaders. We all get sick, almost all of us seriously so at some time in our life. Someday we all will die. These rites are intended to assist believers during those times when we are wrenched from good health and the ordinary conduct of our lives to a place where our physical bodies fail us. The Church intends that this failure does not sink hooks into our spiritual life as well. In fact, the onset of serious illness, old age, and death is an opportunity to unite ourselves more intimately with Christ and the Paschal Mystery. This entry was posted in Pastoral Care of the Sick, post-conciliar liturgy documents, Rites. Bookmark the permalink. Wasn’t aware that the Pastoral Care of the Sick was of the “Mark II” translation period. My lesson learned for the day. The original document was out in 1972 and the translation used was from the early ICEL stage that brought us the current translation of the Mass. While the revision of the Mass translation began with 1981’s Roman Missal II, ICEL was working on a number of projects at this time, including the cleaning up and refining of earlier translations. PCS, RCIA, and the funeral rites were all part of the “Roman Missal II generation,” and included original compositions added to the Latin originals. The marriage and ordination rites never saw print from this stage, and we know the Sacramentary was eventually deep-sixed. All in all, a very good period for ICEL: the best translations, pastoral accommodations for the circumstances of modern ministry, and appropriate creativity that made up for some of the limitations in the Latin editions. Unfortunately, the post-Vatican II translations of the liturgical books — from the Missal, to the various sacramental and non-sacramental ceremonies of the Church — were done way too hastily and were imbued with a theology that was not always in conformity with the Church’s teachings. The “Pastoral Care of the Sick” is an example of this, as well as the “Book of Blessings” published by the CCCB (Canadian Conference of Catholic Bishops). The use of banal, common-place language, and the downplaying of the liturgical rites and gestures themselves, is very unfortunate. The place given to ad-libbing and “adaptations” by the priest have led in large part to the liturgical chaos that has reigned in the Catholic Church for the past 40+ years. What we need are faithful translations that use dignified language and that preserve important ritual gestures. The upcoming translation of the Missal in English is one example of how it is possible to do a good job, if one takes the time required, and if one is faithful to the Church’s theology and Faith. J, I think the evidence is against your first premise here. The books translated in the 80’s all enjoyed wide consultation and a careful translation process that took several years. The Pastoral Care rites we looked at on this site were not the 1972 version, but the 1983. Theological problems are often cited, but rarely with any exactness. Do you have a specific example from this series? It’s all here–just check the sidebar for the pastoral care rites. Once we get to the funeral rites, I think we’ll be able to see that the Comme le Prevoit system could be used to give a dignified translation respectful of the vernacular and with no theological problems of any significance.